The plan wasn't to eat them all. but it felt right, so I went for it. 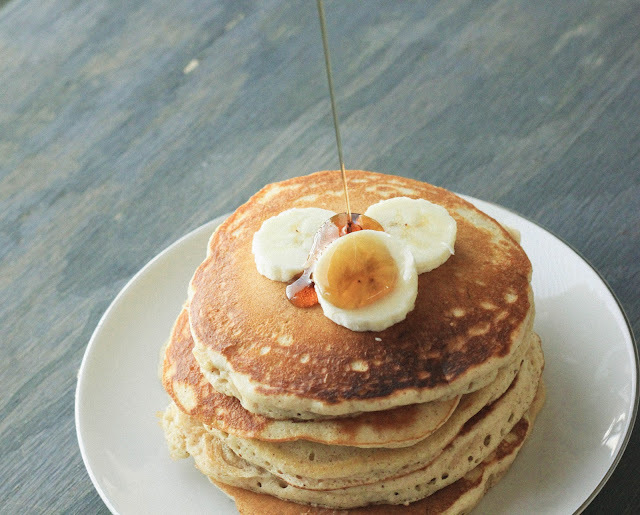 These pancakes taste like banana bread..all day long. 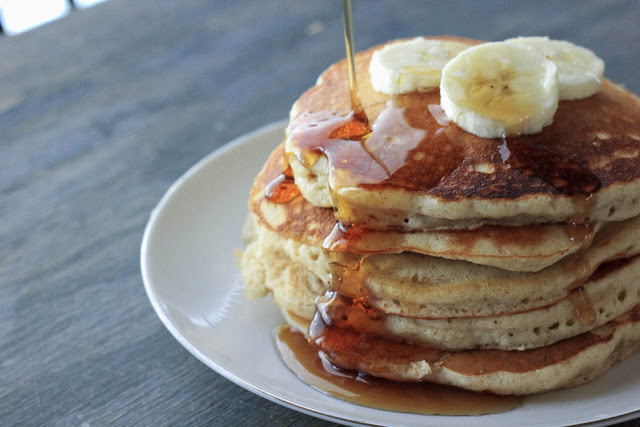 Light, fluffy rounds of banana bread flap jacks that will have your heart racing while sitting in a corner eating stacks on stacks on stacks of maple sryup drowned pancakes. I found this tasty creation in a cookbook that belonged to my great grandmother. Hand written beside a recipe for buttermilk pancakes. She also wrote "much better than Liz Ann's" I have no idea who Liz Ann was but she got trash talked in a cookbook back in 1942. That shall live on forever. When I was young, I was what they call "Hard-Headed"..If you told me to do something, my life goal was to do the opposite. And I knew everything. Everything.. I was a genius.. a witty little 8 year old idiotic genius..
Case in point.. You can not.. I mean you can NOT, eat Dark Karo syrup on pancakes. Wellz.. One summer, I decided to make my own pancakes. It seemed easy enough and Granny was watching The Young and the Restless (so I had like an hour to work with before getting caught). So I got the flour going and eggs and a few other things that I can't remember but I'm sure should not have gone into the batter. Proceeded to strike up the gas to get cooking. NO.. I was not allowed to use the stove, but let's keep going. By some means, I managed to get 2 decent pancakes outta of I don't know how many attempts and put them on my plate ready to dig in. Then it dawned on me that I was missing the one key ingredient.. Syrup. Searching everywhere and coming up empty, I cursed my Grandma to all corners of the universe because I knew she was hiding it from me. Should an 8 year old be using foul language? In the process of accepting defeat and settling down to eat my dry pancakes.. (I'd come this far I was eating those dayum pancakes). There on the top shelf of the pantry, I saw what looked like syrup.. it wasn't Ms. Butterworths but it would do.So I slathered ( I love that word) my stacks in Dark Karo Syrup. Looking back, the realization of how nasty that had to have been continues to puzzle me. Mostly, making me ponder why in the hell I ate them.Then I remember how much of a genius I was. A genius who about an hour after consumption, was pretty sure she was dying of an alien virus attacking her stomach. Did I mention I was dramatic. It scared my grandma to death. I was ready for my last rites, told her she could have all my cabbage patch dolls and requested that my Teddy Ruxpin accompany me on into the afterlife. I did mention I was dramatic, right?.. After a visit to the doctor and a scolding about eating large amounts of Dark Corn Syrup, I thoroughly learned my lesson. Also, by the end of the day I'd learned what other than baking you used Karo sryup for. The moral of the story my children, is to get ya some good MAPLE syrup to eat with these here Pancakes. Learn from the trials and tribulations of your ancestors..
Ok.. so maybe I still have a bit of a flare for dramatics.. but I make good pancakes. "Much better than Liz Ann's"
In a large bowl combine flour, baking powder, salt, brown sugar, cinnamon, and nutmeg. 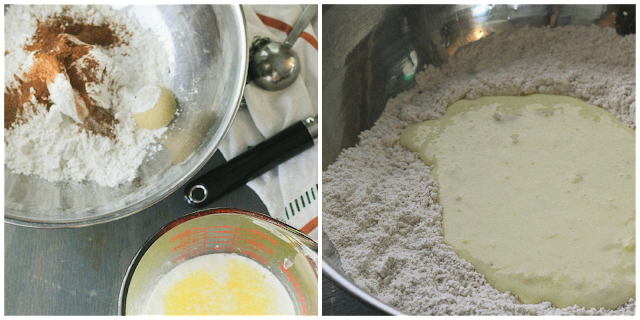 In a separate small bowl, whisk together banana, buttermilk, eggs and melted butter. Add banana mixture to the flour mixture, stirring until moistened. 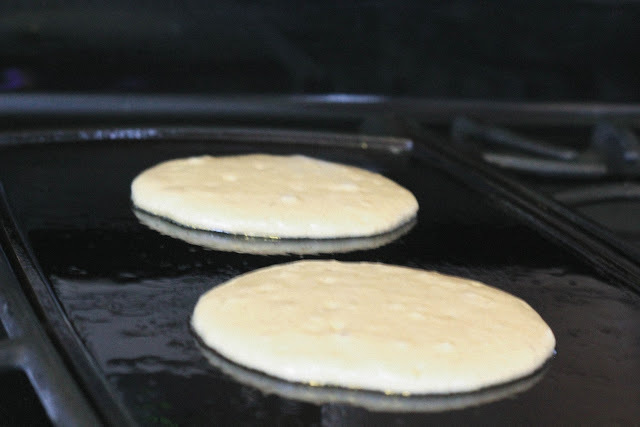 Pour about ¼ cup of mixture onto a lightly greased griddle or skillet for each pancake. Cook over medium heat for about 1 to 2 minutes or until golden brown on each side. Flipping over when pancake starts to bubble and the edges are slightly dry. Remove from griddle/skillet and serve while warm with Maple syrup..